Young Living makes quality their top priority. They have their own farms (in the regions where the plants should be grown), and can absolutely guarantee that no pesticides or herbicides are used in the growing of any of their oils (they use essential oils for pest control and they do all of the weeding by hand). They thoroughly test the quality of all their oils using both in-house testing methods and independent, 3rd party testing. Plus, they are careful to use many different testing methods (not just GC/MS which only tests for certain chemicals and doesn’t test whether those chemicals are synthetic or not). Unlike other oil companies, Young Living only uses the first distillation of oils instead of adding chemicals to get more out of the plant. distillery was honest with the broker, and the broker was honest with the oil company. Young Living does its own farming and its own distilling, so you only have to trust Young Living. Plus, Young Living invites its members to tour its farms and even be part of the harvesting and distilling process. Talk about full disclosure! 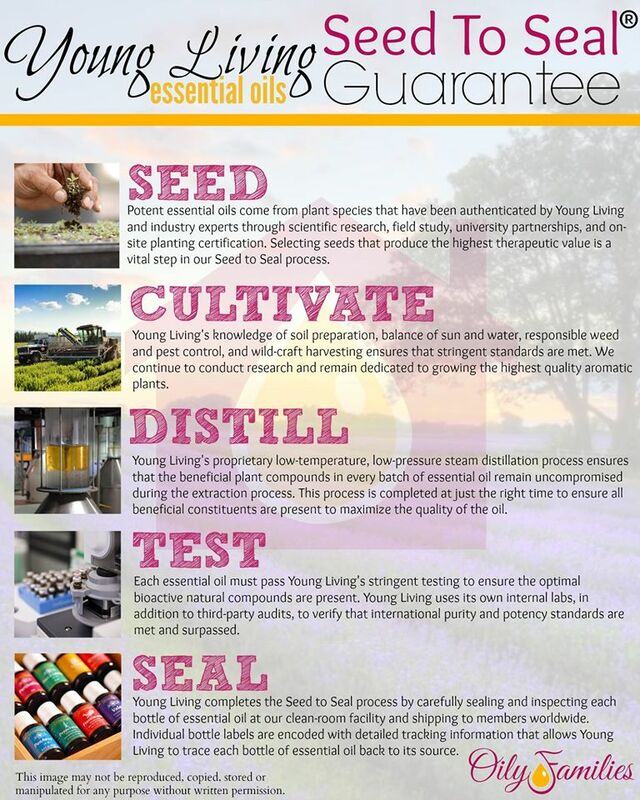 Young Living’s process is called “Seed to Seal” and it’s summarized in the graphic below, but if you want to get the feel of Young Living and what the Seed to Seal process really means, check out the videos posted further down on this page.